The most important factor after proper initial preparation and application in maintaining the long-term beauty and aesthetics of your exterior wood projects is to properly maintain the finish. With regular and scheduled maintenance of the finish, the wood project will look as it did initially, for many years to come. There are many factors which affect the maintenance schedule, including your climate, the exposure that your wood project has to the elements, and UV levels. The maintenance schedules given are only suggestions and are given as guidelines. A regular annual inspection is suggested to assure the finish is in good condition. 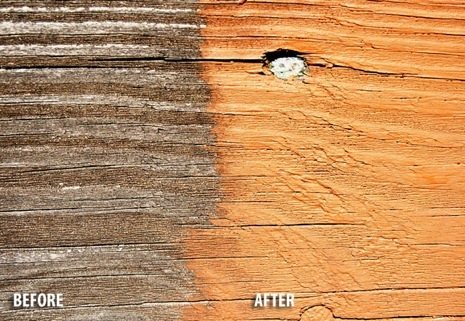 The Basic Rule: All outdoor wood surfaces should be cleaned yearly with a quality cleaner designed for use on outdoor wood such as Timber Pro’s Clean & Brite. Prior to application of the maintenance coat, it is important to assure the surface is clean of all atmospheric dirt and pollution that has accumulated over time. For the preparation of the surface prior to the maintenance coat we recommend use of the Timber Pro Clean & Brite used in a 1:2 dilution ratio with water. 4-5 years on a Northern and Eastern exposure. If the colour coat has worn or faded due to high exposure or leaving the finish too long between maintenance coats we recommend application of one colour coat of the Timber Pro Log and Siding Formula followed by one coat of clear Log and Siding Formula. 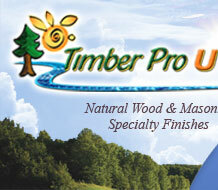 Higher elevation or extreme UV conditions also shorten the time between maintenance coats. Due to the high wear and constant exposure of decks to the elements this application area has a higher frequency of maintenance than any other areas. Do not allow snow to accumulate on decks for any long period of time. We recommend an annual inspection and application of the Timber Pro Deck & Fence Formula colour every 12-18 months. Wooden Outdoor Furniture, Planters, etc. Outdoor furniture maintenance, depending on their exposure, can vary tremendously. For example, if they are brought in during winter months, or covered from the elements, or if their usage is high or low. A general rule of thumb is if the outdoor furniture has normal exposure and regular use is to apply a maintenance coat of the Timber Pro Deck & Fence Formula.